Get Help – to determine your version of PCSchool. 26/5/2012 SCHOLASTIC NZ Change to file format for the collection of Attendance Extract for NZ schools in 2012. 20/5/2012 Curriculum Result Entry. Bug fix in Markbook management where new columns were added and then re positioned in markbook.. This was causing results to display shuffled across a column. If you intend to apply this followup it is important that you have produced you IRD 345 and associated file for payrolls up to 31/3/2012 prior to installing the followup. This will ensure that the Kiwi Employer Super will not have ESCT applied to the initial 2%. Once this report and file has been produced then install the followup. 17/03/2012 POINT OF SALE Changes to save default ‘Transfer to Debtors’ option and also to hide Family balances in Receipt Entry. 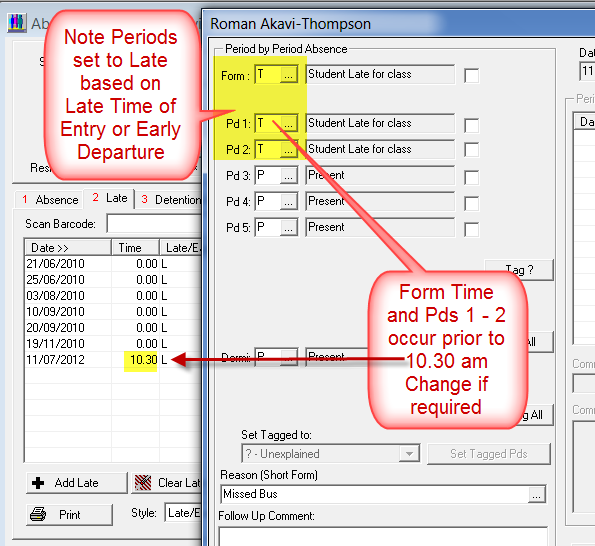 16/3/2012 ATTENDANCE ROLL MARKING Added functionality to Absence Reports to enable user to select to print absences that have a specific status eg Late” for one of the periods in the day. This is an extension of the previous functionality where the user selected based on the overall absence status. 5/3/2012 Changes to Markbook Management where the user is prompted to clear the current Markbook prior to entering Markbook Management. This change was effected to prevent users from modifying the current markbook structure then saving the displayed markbook in the old format. 5/3/2012 Change to Result Entry where the entered mark is passed to a stored table to return standardized scores based on normative tests such as PAT. The program was failing to return converted scores where the Subject Year level was stored as a non numeric year. This has been altered to use the Student Current Year Level should this occur. 2/3/2012 MOE Roll Returns for SQL backend failed to print Table M3. Report was re-released in www.pcschool.net/download/MOERepsSQL.zip Users need to re-download this file and extract to \pcschool\reports\sql . Take the option to Reprint MOE Tables to reprint the missing M3 table. 8/02/2012 Added controlling access to Spider Web App in PCSchool. 17/01/2012 Added Avg Cost and Last Cost to Quick Stock Adjustments in Point of Sale module (POS Version 2011.2.0.82). 9/12/2011 Optimized several end of year functions, inc Roll and Audit file cleanup; Ledger Period End, to take advantage of direct calls to the SQL backend, resulting in significant time saving. 6/12/2011 Added ability when transferring Care Givers to the Identity table to elect whether to create Alumini records simultaneously. In the past this was not an option and the Alumni records were automatically created. 5/12/2011 In Result Entry by Spreadsheet added support to have Areas of Assessment display in the order set with the <restrictclassification>AMP</restrictclassification>. In this case the type “A” Areas will display before the type “M”, and finally the type “P” areas. 28/10/2011 PCSchool improves Point of Sale and implements Stock Take feature. For more details downloand the What’s New with POS, POS Reports Tech Tip or updated POS User Manual. 1/10/2011 Added a Sort Order to the Point of Sale Sales Screen to enable sales to be displayed either in “as entered” order or “Stock Code” order. This order preference is tied to the specific user and will be remembered from one session to the next. 25/9/2011 Added Duplicate to Siblings to Absence/Notes and Behavior. This enables an incident or note to be duplicated to other family members at the press of a button so that if an absence or matters such as a specific family custody note are added to a single family member then this can be quickly applied to all family members. 25/9/2011 Added facility to eMerge so that merged documents can be directed to specific sub-folders within PCSchool Document Management. This enabled eMerge to create a template letter, containing information such as the Student Name and other details, and have this document saved to a folder in document management such as Student\Guidance. Such a document can be then opened in Document Management and used to record and guidance notes on the student. 22/9/2011 Fixed minor bug where Staff partial Day absence was recalculated when the record was altered at a later date. Changed the logic so that this recalc only occurs if the date range for the staff absence is changed. 29/8/2011 – Altered the EMerge control to enable the inclusion of Graphics and HTML as enabled in the email control. Also enabled the ability to write Emails sent via eMerge into Document Management as either “eml” email files or as “rtf” files. 26/8/2011 – In Point of Sale adjusted code so that as students are departed they will be removed as customers so that searches in the POS will be limited to current or intending students. This entry was posted in Latest FollowUp by studentmanagementsoftware. Bookmark the permalink.